So, Professor Falk did indeed endorse my book and, like all my other endorsers, did not cave into pressure. This should indeed concern all Zionists and their agents. On the face of it, HRW is an independent, Non-Governmental Organisation (NGO) ‘dedicated to defending and protecting human rights’. But it takes no more than a few seconds of research to find out that the primary donor of the HRW is liberal-Zionist George Soros and his Open Society Foundation - the same Soros and ‘Open’ society that supports most Palestinian NGOs including BDS which may perhaps explain why the BDS in Ramallah was so eager to compromise on that most precious Palestinian right i.e. The Right of Return. Nor will it surprise you to learn that the same Soros funded HRW has been dedicated to ‘exposing’ of Hamas’ failures on human rights issues? Is this not what you would expect from a liberal Zionist spin meisters? Prof’ Falk had little chance of surviving within such a tribal milieu and the reason is pretty simple. Unlike Zionist Neuer, Liberal Zionist Soros, and ‘Anti-Zionist Zionist’ Roth, Prof’ Falk actually represents the ultimate success of the Zionist project. Early Zionism promised to transform the Jews into ‘people like all other people’. Zionism vowed to bring to life a Jew who transcends the tribal, a Jew who thinks universally and ethically. Early Zionists also believed that such a transformation could be achieved only in Palestine. Of course, they were wrong but no one can ignore the fact that the greatest and most prolific Jewish universalists are actually Israelis (Prof’ Yishayahu Leibovitch, Prof' Israel Shahak, Nurit & Miko Peled, Gideon Levy, Amira Hass, Uri Avneri, Ilan Pappe, Israel Shamir and many, many more). But Prof’ Falk and a few others have managed to achieve a similar goal in the Diaspora. Those Jews whom we most admire and whose integrity we most trust such as Prof’ Norton Mezvinsky, Prof' Norman Finkelstein, Prof’ Falk - all have something in common - they do not operate within Jews-only political cells. Unlike JVP, IJAN, HRW and Mondweiss, all of whom are dedicated primarily to promoting Jewish interests, they are dedicated to universal values. So I argue that Prof’ Falk provides us with a glimpse into the possibility of true Jewish emancipation - the capacity to break out of the mental, intellectual and non-ethical ghetto. Moreover, this latest tale of HRW’s Herem (Kosher expulsion) of one of the greatest humanists of our generation is actually an educational event. While our disagreements with Israel and Zionism are clear, the Modus operandi adopted by AZZs and their relentless attempt to dominate the progressive discourse while, at the same time, stifling freedom of expression leaves more and more humanists suspicious of any form of Jewish politics - be it right, left or centre. I like to think that my Wandering Who was the first attempt to discuss these issues openly. I wrote it because I, too, am a wanderer who decided, instead of dwelling on someone else’s land, to leave my homeland. Perhaps Prof’ Falk endorsed my work, because, like myself, he too is a wanderer. He self-reflects, examining his identity and his notion of justice from a transcendental point of view. Like myself, he is an artist, a poet, a man who searches, against all the odds, for beauty, peace and truth. 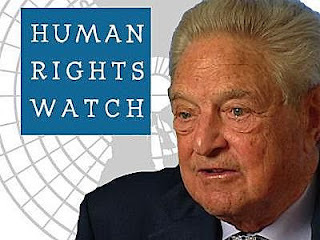 On the other hand, George Soros’ Open Society Foundation contributed $100 million to HRW just to silence ethically and aesthetically driven souls such as Prof’ Falk and others.